Download a PDF of The Well-Woman (2017) CityLights Issue. The well-woman is found at the intersection of reproductive health, rights, and justice. To improve women’s health and health outcomes, the MCH field must begin to focus on the health of the whole woman and ensure a woman-friendly health system for all women at the local, state and federal level…. CityLights Emerging MCH Issue (2016) – Local Responses: Zika Prevention This issue of CityLights highlights the extensive work from our national partners to learn more about Zika virus and provide recommendations, as well as the work of a couple CityMatCH member health departments to respond to the issue at hand. 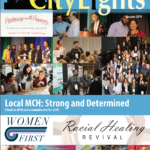 Download a PDF of the Growing the Field (2014) CityLights Issue In this issue of CityLights, we highlight CityMatCH leadership & workforce development tools, resources, and opportunities available to CityMatCH members, as well as other resources available to all MCH professionals.